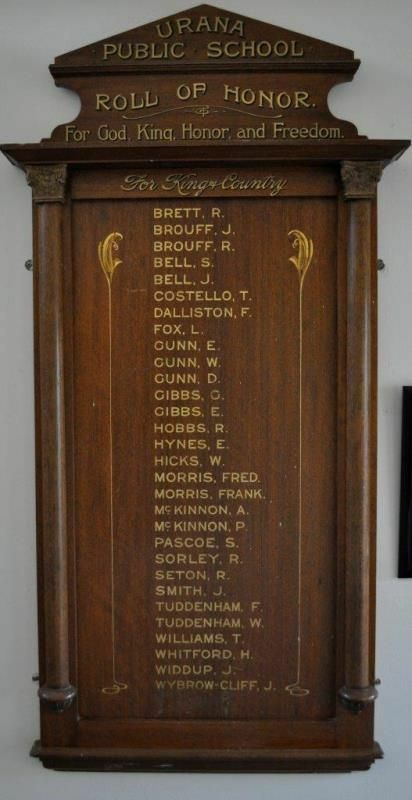 A wooden honour roll commemorates old boys from the school who served in World War One. The unveiling ceremony of the Honor Board of the Old Boys of the Urana Public School who have enlisted to fight for liberty and freedom, took place on Thursday morning in the school grounds owing to there not being sufficient room in any of the class rooms. Luckily the morning was nice and bright, and the position chosen was sheltered from the wind, and allowed of the verandah being used as a platform, while the visitors and children were seated just in front. The attendance was fair, and no doubt would have been greater had the function taken place in the afternoon. Among those present were some of the relatives of the soldiers who were being honored. Dr. Macknight was in the chair. The proceedings opened by Miss Annie Young, dressed as "Britannia" breaking the flag, The proceedings were interspersed with singing by the children, assisted by those present, Miss Culley presiding at the organ. The Honor Board, which is of polished Queensland maple, looked splendid, the names, which were in gilt lettering, standing out clear and distinctly. The selecting of the Honor Board and the whole of the arrangements were carried out by Mr Newell, who deserves great credit for the manner in which he performed his arduous duties. The roll was unveiled by Mrs. Macknight who asked Mr Newell to read same, which was as follows URANA PUBLIC SCHOOL. HONOR ROLL. For God. King, Honor And Freedom.For King and Country. Brett, R., Brouff, J., Brouff, R., Bell, S., Bell, J., Costello, T., Dalliston, F,. Fox, L.,,Gunn, E., Gunn, W., Gunn, D., Gibbs, G., Gibbs, E., Hobbs. R., Hynes, E., Hicks, W., Morris, Fred, Morris, Frank, McKinnon, A., McKinnon, P., Pascoe, S., Sorley, R., Seton, R., Smith, J., Tuddenham, F., Tuddenham, W., Williams, T., Whitford. H., Widdup J., Wybrow-Cliff, J. For God, King, Honor, and Freedom.